If you’ve ever been browsing on a Mac and clicked a mailto: link, you may have discovered that it often tends to default to the Mail app. If you want to use Gmail (or another email service) you need to make a few changes. To be clear, the problem isn’t with opening links in another email client like Outlook or Thunderbird. Many solutions we found explain that all you have to do is open Mail’s preferences and select the default email reader. This only means email will open by default in another email client. If you want mailto: links to open in Gmail on Safari or Chrome or any other browser, however, then doing this won’t work. You actually have to cut out Mail altogether and make the changes to the browser itself. 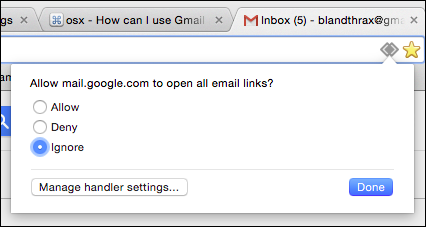 On Chrome, it’s incredibly easy to default open mailto: links in Gmail. You can simply open a Gmail window and click on the gray double diamonds next to the bookmark star. Out pops a dialog asking if you want to allow, deny, or ignore. If you choose “allow” or “deny” then either way, you’re set. If you later change your mind, such as if you realize you do want to open mailto: links in Gmail, then you can change it. Type “chrome://settings/handlers” in the location bar and choose (or remove) gmail as your mail handler. If you use Firefox, it’s also easy. Open the preferences (“Command + ,”) and click the “Applications” tab. Scroll through the “Content Type” until you find “mailto” and then choose your default “Action” from the right column. Okay, so those are third-party browsers, but what about Apple’s own Safari browser, which a great number of Mac users use by default? Unfortunately, Safari doesn’t have a simple way to set applications handlers. 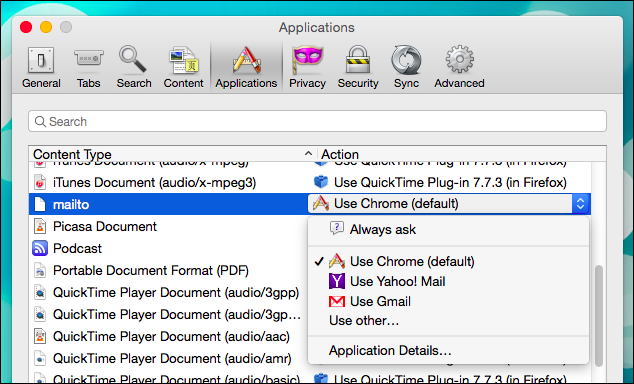 We searched for an easy method (keyword: easy) such as a setting or configuration file, but the only way to reliably do this in Safari is using the mailto extension (it’s also available for Opera and Chrome). The mailto extension works for more than simply Gmail. Once you download the extension and install it, a configuration screen will open. Choose your mail service and then restart Safari. Now, when you click upon mailto: links, your email service should open in a compose tab. Note, if your email isn’t represented in this list. You can click “Custom URL” at the bottom and add it. You should perform a web search or consult your email’s knowledge base for what that URL would be. If you change your mind or email service, you want to open Safari’s preferences and click the “Extensions” tab then “Uninstall” to remove the extension, or “Options” to reopen the configuration page. That’s all there is to setting Gmail as your default email on OS X, and hopefully you can use these methods to change your mail handler regardless of the service. If you have a question or comment to add, we encourage you to add your thoughts to our discussion forum.